this would be awful, Im sure I would fly out of there with fright. 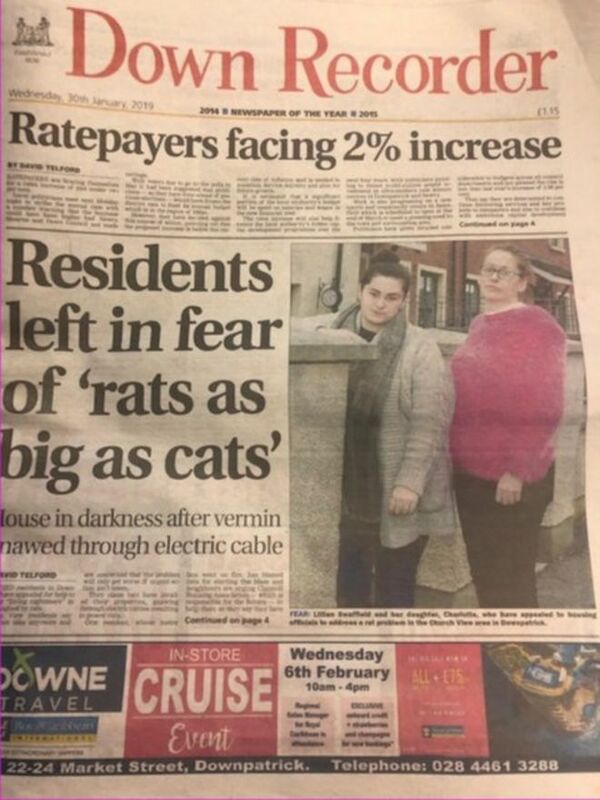 "One resident, whose meter box went on fire, has blamed rats for starting the blaze and neighbours are urging Clanmill Housing Association — which is responsible for the homes — to help them as they say they have had enough." "The houses were redeveloped a number of years ago and converted from three-storey to two-storey homes, with the former ground floor filled in. Residents believe this is how rats are getting into their homes and climbing up cavity walls and into their roof space." "My power went off last week and when I called an electrician he discovered that the rats had gnawed their way through an electrical cable." "Lillian explained that an electrician who was able to provide her with a temporary fix and restore power to her home, admitted that he had never seen anything like it before in his life." "Clearly the rats are in the roof space and it is horrendous. My daughter, who lives nearby and has two small children, is very afraid for their safety." “Light bulbs have been blowing for years and my meter box even went on fire. I have no doubt that rats were responsible and while we have been having problems for a long time, no one appears to be listening to us,” she continued." "Lillian says residents believe all the homes along Church View are “plagued by rats” and that the issue needs to be investigated urgently." "Councillor Billy Walker, who joined residents for a meeting with Clanmill officials on Monday afternoon, believes the social housing provider needs to order an immediate examination of the electrical wiring in all the Church View homes. He also believes money needs to be earmarked to rewire the properties." There are even more horrifying reports in that article.
" 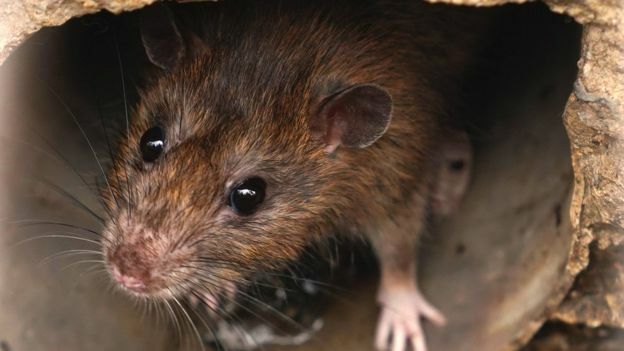 'Relentless rats' force mum and children from 'dream' Northern Ireland home"
"A mother of two children forced to flee their home in the Bogside area of Londonderry because of a relentless rat infestation has welcomed a multi-agency agreement to tackle the problem head on." "Despite previous efforts to get rid of the rats by the Housing Executive the pests have persisted to the extent that Mrs Gill is now staying with family members." "Speaking to the Belfast Telegraph, Mrs Gill said: “Three weeks after we moved into our house we noticed a really bad smell which we thought was a fault in the way the washing machine had been plumbed." “When we lifted the floorboard we found a dead rat. After that there was nothing which was grand but we were decorating the house bit by bit and when we went to decorate an extension we noticed the same smell and I knew right away it was another rat." "From February 2017 to July we took out another nine dead rats from our attic." "So many nights we lay listening to rats running around the attic and up and down in between the wall cavity. My two children were terrified and at times it was that bad we went to family to stay." 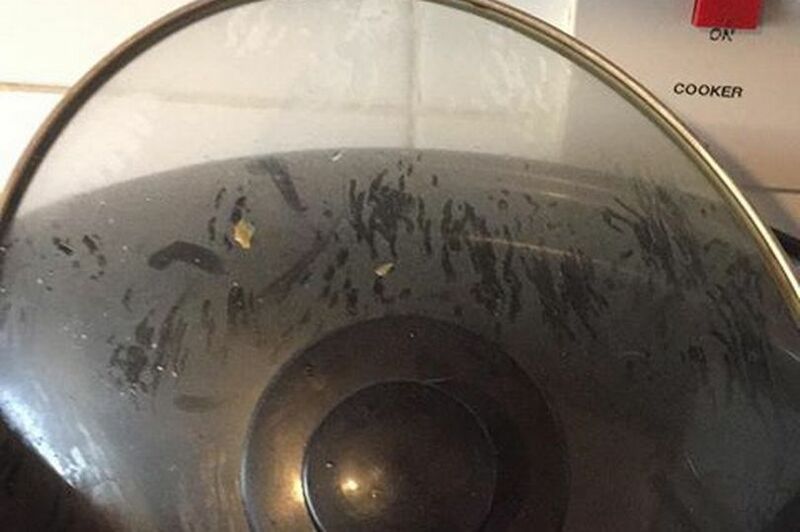 "Belfast man forced out of his home by rats nest in boiler"
"Delays in dealing with the situation have been blasted"
"Rat footprints on a sauce pan lid in the kitchen"
"A man forced out of his North Belfast home by a rat infestation has hit out at delays in dealing with the problem." "Andre Perrot said unwanted vermin have been an issue in the New Lodge since he moved there two and a half years ago." "The 27-year-old claims he first reported noises in the ceiling of his Pinkerton Walk home last year, but then his boiler broke two weeks ago and a rats nest was found inside." "Andre told Belfast Live: “It is horrible to have to live like this." "I smell rats everywhere I go and at night I can hear them running around like crazy in my ceiling." "They are running about through my dishes and everything." "I have had to feed myself in these conditions, with not even hot water to wash my dishes. I haven’t been out because I feel that dirty and paranoid." "I have been telling them from day one the situation is really bad and begging them to rehome me because I have had no heat and no hot water since last Saturday (December 29)." "Andre was moved to emergency accommodation so the rats can be dealt with just yesterday, but said he reported the problem with the boiler over 10 days ago." Rats need food. The Council lack of waste disposal facility provids the food they need. Don't beat about the bush, the problem is only going to get worse.